La Crosse, WI (WXOW) – Cabin fever got you down? 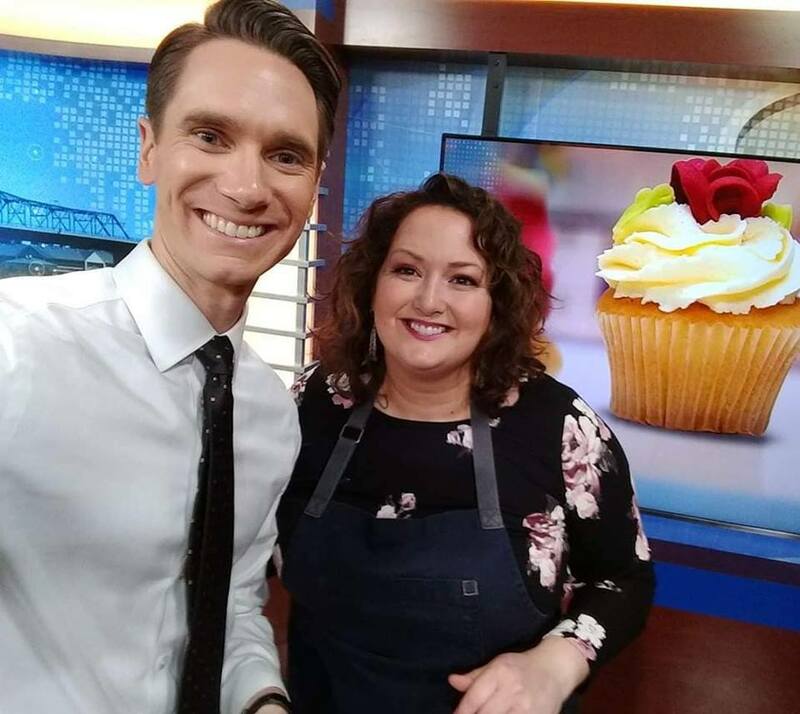 Two-time Food Network Holiday Baking Champion Jen Barney of Meringue Bakery has the sweet treat to boost your spirit. When it comes to baking at home, she said it’s not too hard for even novice bakers to make their creations look professional. Barney shared some of her best tips exclusively with News 19 Daybreak. First, she said all of the equipment needed can be picked up at a local shop. There’s no need to special order any state-of-the-art tools to make the most of your cakes. Standard piping bags, large tip round and star-shaped nozzles, a basic butter knife, stand-mixer and an ice-cream scoop are keys to success. When it comes to the frosting, she suggests completely filling to the top the mixing bowl with your favorite buttercream frosting recipe and letting it mix with a paddle attachment for at least 10-15 minutes. Barney said that gets all of the air pockets out and makes for a smooth, velvety frosting. For the cupcake itself, Barney said it’s important to make sure each liner is filled enough, and it might take some practice to find the perfect balance. She said it’s best to have a small mound over the top of the liner when its baked. That way, you have an easy surface to work with and a good cake to frosting ratio. If you want to add a pop of color and flavor, she said to find some fruit powder instead of a jam, preserve or food coloring. The powder shouldn’t change the consistency of the frosting. An ice cream scoop is a great substitute for piping the frosting onto the cupcake. Barney said simply scoop up some frosting, top the cake and smooth it out with a knife or spatula to create a smooth top with which to work. For those who go the piping route, using a large round tip, Barney said start from the outside around the edge and work your way in to create that ice-cream cone effect. When making rosettes, do the opposite! She said start from the inside and work your way out to make a beautiful flower. Barney’s pro-tip for decorating the cakes with sprinkles? Put a fair amount in the palm of your hand and dab the cupcake around the edges, turning it to pick up the sprinkles from your palm. Don’t forget to place a box underneath to catch the sprinkles. When topping with fruit, like raspberries, Barney said make a simple glaze. She used an apricot preserve with a small amount of pineapple liquor, heated to create a smooth, yet slightly thick texture. She then “painted” the berries with the glaze using a basic paint brush (used for food only!) creating a shiny, beautiful topper. You could top the cakes with the chalky, candy hearts that are everywhere around Valentine’s Day, but why not make one of your own? Barney suggested getting some colorful packs of fondant, a heart-shaped cookie cutter and edible markers to create a special message for that special someone. Bottom line, Barney said, when all else fails, put your cake creations in a beautiful box and wrap it with a ribbon. That, she said, can fix even the messiest of cakes! Episode #6 She's Coming in Hot! It felt so good to have another great week on Food Network’s Holiday Baking Championship. It had been four weeks since I’d had a win in a preheat or main heat challenge. Competing against the talents of Stephany Buswell, a Certified Master Baker, the wiz kid Joshua Livsey, and pastry instructor Ian Barthy had been really hard! The personalities and talent on this year’s show are daunting. The remaining three challengers were all talented chefs who have careers baking professionally every day. In a past life, Ian was an incredible savory chef who switched careers to teaching high school students a love for culinary arts. To date he had been a strong contender in the competition; he is incredibly skilled at understanding the fundamentals of good baking. His past as a savory chef also gave him a unique advantage because he knows how to bring in savory flavors. I will never forget how he turned boxed cake mix into a sweet and savory apple bacon crepe! When I think of Stephany, I see wildfire! She is a force to be reckoned with. Her constant upbeat attitude and fun nature attracts everyone in a room. She is the person you want at your table. She is the oldest person in the competition this year, but her age only helps her as she as been baking at a professional level for more than 20 years. She is one of those bakers that understands relationships between flavors and how to effortlessly incorporate strange combinations together. One of her best dishes so far—which she coined a breadamisu—effortlessly combined sweet potato, tiramisu, and bread pudding! Can you imagine? The judges went crazy over it! Watch out for Joshua because this wiz kid is going places. He has mad skills as a baker and is able to turn any dessert into a visual masterpiece. Joshua is an artist at heart and his modern way of plating is on trend and always perfect. He is poised, funny and he inspires me to be a better baker. One of my favorite desserts from his has been when he made a champagne pudding dessert into a snow globe-inspired dessert served in a martini glass. And then there is me, Jen. If I were to characterize who I am in comparison to this group, I would say my strongest skills are that I am a baker who understands how to infuse unusual flavors together into rustic feel-good desserts. One of the favorite flavors I have incorporated so far in this competition is a tarragon meringue. My strongest skillset is that I have a creative background and it is easy for me to visualize how to turn something into art. When it came time for Episode #6 I believe my time working at The Mint in La Crosse, Wisconsin, really helped me do well. The Mint is a farm-to-table restaurant and chefs there use seasonal produce local farmers are able to produce year-round. I helped them make desserts when they first opened in 2015. Making desserts for The Mint really forced me think outside the box. For example, there are local farmers who have green houses who are able to make herbs year-round. At The Mint we would get tarragon in January and I would need to understand how to turn it into a dessert or jam in middle of winter when there were not a lot of fruit options. I made a lot of jam at The Mint as a way to preserve fresh fruit to last through the winter. I became very good at making marmalade, a jam that turns the rinds of citrus fruit into jelly. The preheat challenge in episode 6 required us to make a sufganiyot, or a Jewish-style jelly doughnut in 90 minutes. For any non-bakers reading, 90 minutes is not a lot of time to make a yeasted product. I had an idea running around in my head through the entire competition to make a snowman inspired dessert and I knew right away I wanted to make my doughnuts look like little snowmen. I believe it helped me when I made smaller doughnut-hole size doughnuts because it helped them rise faster than a larger doughnut. Every minute mattered in this challenge. When working with yeasted products you can help speed up the rising process by putting the dough in a warm moist environment, but you can only do so much. There is a bakery saying that says “Nothing waits for bread.” It means that yeasted products move at their own pace and when they are ready they are READY, and you need to stop everything to start the baking process before it becomes over-risen. While I was waiting for my dough to raise I made a grapefruit, apricot, and peppercorn jam, inspired by my days spent at The Mint. I also made creme fraiche. By the time the challengers had our doughnuts fried, we only had minutes to fill and plate our finished product. When you look at all of our plates it is obvious that it was a very rushed process! My snowman idea paid off and I had just enough time to skewer my little filled doughnut holes. On TV there is a comment made by Joshua where he questioned if my plate was going to look Hanukkah enough (despite the way is was portrayed on TV, it was one friend looking out for another), but the challenge was to make a jelly doughnut and not a Jewish plated dessert. My plated dessert looked less like Christmas and more like a cold winter’s day. The other challengers struggled with having over-risen doughnuts or doughnuts that were left in the fryer too long. Mine were just right and it was good enough to win me the advantage in the main heat! It ended up being a HUGE advantage for me because the main heat challenge was to reinvent the fruitcake. As an extra bonus, I was the only constant that could use common fruitcake ingredients like almond paste, candied kumquats and orange peel. I have a tried and true recipe for a fruitcake that is made with all golden fruits and it was the prefect fit for this challenge. My main inspiration for my fruitcake was to pay homage to my family and to honor Wisconsin dairy farms. My cake was decorated with a red barn and looked like a scene from a greeting card. When it came time to show my blond fruitcake to the judges I couldn’t help but to cry when I explained the meaning behind this cake. My parents built my childhood home on an acre of my Grandparents’ farm land. As I grew up, I had a fantastic childhood of running through corn fields and feeding calves. At Christmas (even as an adult) I have never had a traditional Christmas morning like you see in the movies where everyone wakes up in their PJs and and opens presents from Santa. On a dairy farm, the adults are busy milking cows in the morning; we always opened our presents from Santa in the evening after all of the chores had been done. My story strongly connected judge Nancy Fuller, who has a show on Food Network called Farmhouse Rules. Off camera, Nancy and I both had a good cry together. It has now been several days since the show has aired and I have been overwhelmed by the love and support I have gotten from the farming community. My feeling and emotion in this episode were genuine. I really do miss my grandparents, and I miss the feeling of community I received growing up in a small town in Wisconsin. I am the product of generations of dairy farmers. One of my proudest moments in my life came at the end of the episode when I was advanced in the competition and given a spot in the season finale. (Goal #3... check!) As always, it was a bittersweet moment for me because my advancement meant Ian had to go home. We had all worked so hard to get into the finale and it hurts to see someone miss it by just a thread. Ian is such a class act. He is an inspiration to his students and his family. I remember so distinctly the feeling I had when I got back to the hotel room that night. I knew that if I could make it into the finale I could stand neck-and-neck with Stephany and Joshua. Throughout the season I had stood in their shadows because they have always been one step ahead of me when it comes to plating desserts. My career and my business, however, is centered around making dessert showpieces for weddings. The finale challenge until now had always been a showpiece challenge. The night before the finale I stayed up and studied holiday images until midnight. I tried to take any Christmas movie, saying, pop culture reference and visualize how I would turn each idea into a holiday dessert. I had no clue what the producers were going to throw at us but I wanted to be prepared. The feeling of knowing I had a 33.33 percent chance of winning $50,000 in the next 24 hours was intoxicating. There was pure adrenaline pumping through my blood! In the kitchen we have another saying, “I’m coming in hot,” which means to watch out because you’re holding a hot pan! Based on my performance in Episode #6, I had a renewed sense of confidence and I was coming in HOT! Episode Five - What's not sweet? Landing in the bottom two. If you saw last week’s episode, you know that for me, they call it a main heat for a reason. The heat was certainly on when I landed in the bottom two. But if you remember my mantra, from the first episode, I only had to outperform one person. That became my saving grace last week. The dessert that landed me on the chopping block last week was a Brie Cheesecake Paris Brest. A Paris Brest is a French dessert that has choux pastry (the type of dough a cream puff is made from) and praline cream in a round shape made to resemble a bicycle tire. It is named after a bicycle race called the Paris Brest, an event that still happens today. When I was planning this dessert for the competition I was really inspired by the idea of cheese platter. I think of a cheese platter as an appetizer best shared with friends. I had an idea to make a cheesecake into an appetizer. I wanted to make it larger than a single serving because I thought it would be cool to have a dessert multiple people would eat from. Baking perfect choux dough is not for the faint of heart, and mine last week was text book dough. It baked off beautifully. I then made a cheesecake two different ways: a baked brie cheesecake filling and a brie cheesecake mousse. I also made a pinenut praline and elderflower fig compote. For this particular dish I wish I would have done so many things differently. Perhaps I should have done away with the choux dough. It might have read better as a dessert appetizer if it actually looked like a typical dessert cheese platter and not as a Paris Brest. I should have separated the pinenuts from the brie cheesecake (not inside the Paris Brest) so it would not compete with the brie flavor. At the very minimum, I should have eliminated at least one component—I simply had just too many different pieces going on. At this point in the competition small missteps make a difference. Lorraine was particularly critical of the dessert, but I still don’t think my dessert’s large size should have been such a turn off. There was nothing in rules that said an individually plated dessert had to be a certain portion size. Lesson learned – apparently my idea of shared appetizer did not translate at all. I will be humble enough to say that I did not love my dessert enough to want it on a restaurant menu. I will also like to say I thought Stephany and Josh deserved to get high praise from the judges. After I survived the chopping block on Episode #5 I had a heightened sense of how important it is for me to up my dessert game. My odds of winning $50,000 at that point were at 25 percent, as were my odds of going home. That’s when I realized I really, really wanted to make it to the finale. #1 Do not be the first one to be voted off. CHECK. #2 Make it more than half way of the competition. CHECK. #3 Make it to the finale. #4 Win $50,000 and the title of Holiday Baking Champion. I’m just one step away now from Goal #3. Episode 4: Goal #2, Check! When I first started on the Holiday Baking Championship, I entered in hoping and believing I could win. Like a true goal setter, I broke down the goals into manageable steps. My first goal was not to be the first person voted off; my second goal was to make it make it more than half way. After I survived another week, I was so happy and relieved to have achieved my second goal! Episode #4 was a good week for me. In the preheat challenge we had to take a box cake mix and make anything but a cake. This was a challenge I felt comfortable with. There is a cake called a St. Louis Gooey Butter Cake. It can be made from scratch but is usually made with a box cake mix. It actually has more of a bar-like consistency, and it’s fun to eat because it has a really goopy texture. It is one of the guilty pleasure desserts that you can’t stop eating once you start. In all honesty, this is the only recipe I have ever attempted from a box cake mix. When the challenge was announced, my mind immediately went to this type of bar. I paired the gooey butter cake with ginger, lime, and raspberries to brighten up the rich and dense dessert. Overall the judges were pleased. My biggest critique came from Lorraine, who thought that I shouldn’t have cut the raspberries in half. In the end, Ian won this challenge and he deserved it. He thought way outside of the box and made a sweet and savory crepe. I thought it was such an original idea and I wanted to try it at home! On top of being a talented chef, Ian is such a gentleman—inside and outside of the kitchen. I wish you could have heard him talk about his family; he puts his wife and kids on a pedestal. He is positive, supportive and never complains. For the second challenge the contestants needed to “holiday up” a non-holiday dessert. The dessert I pulled was a fruit tart. I decided to make a Chinese 5 spice tart. Chinese 5 spice is made up of cinnamon, cloves, fennel, star anise, peppercorns, and sometimes ginger and nutmeg. I decided to use it purely on a whim. I saw the container and I thought it would be fun to incorporate an unusual spice that has not been used in the competition yet. I knew it was a risk because there are some savory notes in this type of spice. As I was making the tart shell, I decided to make two shells in case one broke. My tart dough is buttery and flaky, but it is not the sturdiest dough. The long rectangle shape of the tart pan sent red flags out to me because I know that the weight of the shell is not evenly distributed and it could have structural problems. Let me tell you—I was so happy that I listened to my intuition! My first shell cracked in half! When this happened, the cameras started swarming my station to watch and see what would happen with my second tart shell. I was shaking so much but I was so happy they did not show my face on TV while I was transferring the tart because sweat was dripping down my forehead! I was so lucky that only a small piece broke on the side of my second tart shell. If my second tart shell had broken I might have been able to fix it with white chocolate as glue. But it might not have worked and would have certainly taken up a lot of time. Thankfully, the second tart transferred to the plate in one piece. Once again, the judges liked my tart overall and visually it was really pretty. Lorraine did not not like Chinese 5 spice, so I chalked that up to “Let’s agree to disagree.” I was happy that I picked an unusual flavor, and I liked how it tasted. I love using pepper and savory notes in desserts to add complexity of flavor. I have to mention that Duff Goldman came out to “help” me serve the tart and he was just wearing a pair of gym shorts! I was so nervous cutting the cake that I didn’t even look at him until he started to walk away! Nothing like business on top and party on the bottom! I wonder what he usually wears under that table? As in any career, there are many types of pastry chefs that excel in different categories. Just to name a few: we are employed in hotels, restaurants, bakeries, coffee shops, etc. We can specialize in making edible sculptures, classic European desserts, home style plates or cakes. In my business, Meringue Bakery, I excel at making fancy decorated cakes. At this point in the competition, I am getting frustrated because I feel like I have not been able to shine with cakes. The competition is only getting harder and I hope that I can last long enough to at least make one fantastic decorated cake for the world to see! My next goal only requires me to last through two more elimination challenges. Today, I’m one step closer. Episode 3 "Burly Like a Bulldog"
Mandarin Orange Honey Caramel Nut Tart by Jennifer Barney. Photograph taken by Zack Smith and courtesy of Food Network. During episode 3, I was really nervous because I knew it was going to be Thanksgiving themed and I am not a skilled pie baker. Oftentimes, people who are first introduced to my bakery assume I make pies. I do not blame them; my business name is Meringue Bakery, which makes most people think of lemon meringue pie. However, I picked the name because we use the meringue technique in our bakery every day, especially in our buttercream which has a meringue base. I would not call myself a confident pie baker. For the first challenge, my job was to take canned mandarin oranges and turn it into a delicious dessert. In the end, I produced a mandarin orange and honey caramel nut tart for the preheat challenge. I made my first big mistake when I started cooking my tart filling without eggs! I was able to rebound quickly by pulling the tarts from the oven, scooping out the filling, and mixing in the eggs. I covered the tart in a homemade honey caramel and the judges loved it. Duff said my tart was “burly like a bulldog.” Lorraine, however, was not impressed with my frangipane, the almond nut filling. I have to say, in reflection, that she was right. It would have been better for me to keep the nuts out of it and stick with just the flavors of honey, caramel, and oranges. I had too many flavors in the tart and it would have been better to keep it simple. I swear, the producers must have been drunk when they thought up the next challenge! We were responsible for making a holiday “mash up” by combining two desserts that do not normally go together. I received lemon bars and pecan pie. I instantly went to a dessert I felt comfortable making: an amazing lemon curd filling we make at Meringue Bakery. When I worked at The Waterfront Restaurant in La Crosse, Wisconsin, I used to make a chocolate hazelnut dessert that had a hazelnut nut cake called a daquoise. For this challenge, I planned on making a pecan daquoise filled with a lemon curd. Halfway through the challenge the host (and former Bachelor) Jesse Palmer came out to let us know that we needed to incorporate sweet potatoes. Think about it: I have to make a dessert that tastes good and has lemons, pecan pie, and sweet potatoes! I did not have the worst combination though. Andra had to figure out how to combine chocolate mousse, blueberry pie, and sweet potatoes! Things can always be worse! I baked off a sweet potato pecan pie filling and I spread it along with the lemon curd filling between the daquoise cake layers. I molded my cake to look like an acorn and I toasted marshmallow frosting on the outside of it to give it a rustic look. As I stood in front of the judges, I knew I was really proud of my cake, but I also knew that the flavors were not strong enough to give me a win. Nancy, Duff and Lorraine all agreed that the sweet potato flavor was weak. However, they also collectively agreed that the sweet potato flavor would have ruined the flavor of the lemon / pecan dessert. Aristo was sent home this week. It is hard to get to know each contestant by just watching the show on TV. In real life Aristo is a really great man. He is the guy who makes sure everyone in the room is happy. He loves telling horrible jokes. He is really proud of his family, and he loves his two dogs. His family has a cabin in Wisconsin and he travels up here occasionally. He knows I’m going to invite my family over to his cabin the next time he is able to make it up to the northwoods! One day, not so long ago, a representative from Food Network called me to see if I would ever be interested in applying for a Food Network show. The audition and application process was long and demanding. It is not enough to be a qualified baker: I was tested on my personality, how I react on camera, and what makes me a unique person. As a mother, foster mom, wife, and business owner, throwing another log on the fire seemed daunting at times. It was so much work to physically leave. I left my husband with a calendar of where the kids would be on each day, the bakery work was taken over by my dear and trusted friend Jill, and with a lot of hard work I was able to jump on a plane. Arriving to the studio on the first day felt a lot like a first date: I had overanalyzed my entire wardrobe, I was curious to find out who I would compete with, and I was totally open to the unexpected. Standing in a room with all of my competitors for the first time felt awkward for only moments. We quickly realized that we have a lot in common as we shared stories. One gentleman quit his job because they would not give him time off to be on the show. It made me feel silly for complaining about how hard it was to organize my business and home in order to be able to leave for the show. This guy did not have a job to go back to. When one of the producers told us that there had been thousands of applicants for the show, I felt the enormity of how lucky I was to be there. Let’s talk about the kitchen. It was huge! My estimations say that the kitchen studio was the size of a large high school gym, perhaps even larger. The space was broken down into kitchen pods and there was a lot of space for cameras and staff to move around the floor. There were so many cameras! The equipment was high-end and I was so awestruck by the enormity of the production that I had little time to feel nervous. I remember feeling ready and I just wanted the timer to start so I could start doing what I do best: baking. My first challenge was to make a holiday-inspired dessert using a sour cherry candy cane as my inspiration. Let me tell you—it was hard to be inspired by that candy cane! The artificial flavoring was harsh, but I felt like I could replicate the sour notes. Before I even set foot into the kitchen, my strategy for the first challenge was to have a cupcake be my vessel. A cupcake is easy and versatile. When the clock started ticking, I immediately started playing around with the idea of a sour cherry chocolate cupcake. The cake recipe I chose is a staple recipe at Meringue Bakery. In the pantry I find Amarena cherries, a true Italian delicacy. They have a very bold cherry flavor and the syrup it is canned in is rich and sour. I was lucky to find the cherries because they became the vehicle for the sour cherry flavor. As the clock kept ticking, I had a very hard time with my edible paper garnish. Originally my plan was to make the wafer paper (a medium that looks like a piece of paper) into a pink Christmas tree. However, I made the mistake of spray painting it with too much pink color, which began to dissolve the paper. It was a hot mess. I spent about 15 minutes trying to make it work, but in the end my Christmas tree had become pink tinsel. Every second matters when competing and before I knew it, two hours had flown by! At last, I am in front of the judges. On TV they show each contestant being critiqued for 30 seconds. In reality it can be upwards of 10 minutes per person. The first judge, Nancy, thought pink is not a holiday color. The second judge, Duff, loved my cupcakes. The third and final judge, Lorraine, thought the chocolate cake was “just a little boring” and she did not like my chocolate frosting. As I turned to leave Duff told me I made a solid first dessert. I let out a sigh of relief as I exited the kitchen. In between challenges I had time to think about how to do better next time. I immediately changed the location of my microphone pack. For the first challenge I clipped it to the top of my leggings. The weight of the microphone kept pulling my pants down. I am sure I made a great first impression with the camera men, me yanking my pants up all of the time! I had a sound technician cut a hole in my apron and we managed to hide the microphone in the apron pocket. I was so relieved to be rid of that problem. One of the hardest obstacles was physically working in a new kitchen space. Each of our kitchen pods contained the basics utilities, but the contestants had to share a lot of items, like cookie cutters. During the first round I felt like one of Isaac’s little chickens, running around with my head cut off! Before the next challenge I visualized where all of the equipment and ingredients are. In between challenges, I had time to talk with Josh “Ganache,” a fellow competitor, who gave me sage advice. “You only need to be better than ONE person.” It became my mantra and it helped calm my nerves during stressful moments. For the second challenge, I needed to make a dessert that tastes like a Cranberry Mint Julep. To be honest, I have never had a julep of any sort! However, cranberries, mint, and bourbon sound like a great pairing. Another strategy I had pre-planned is to stay true to what I know. I felt like this is not the platform to be trying techniques for the first time. I thought about a dessert I used to make when I was a restaurant pastry chef. It involved a nut tuile with frozen mousse and a sauce. I turn that familiar formula into a mint-infused mousse that was served with a bourbon soaked sponge cake and garnished with boozy cranberries and a peanut tuile. It did not air, but the peanut tuiles kept breaking and I had to serve one of the judges a broken cookie. When I stood in front of the judges, I had mixed feelings about their reviews. Lorraine said the plate was messy and I understood her point of view. Duff told me I know my way around a cranberry! He and I had a quick conversation about the different flavors of cranberries as well as Wisconsin’s love for the fruit. I felt proud to be representing Wisconsin with my dessert. Nancy’s critique was that the dessert needed more bourbon. I totally disagreed with her because by my estimations, each plated dessert had a full shot of bourbon in it! I could tell that Nancy seemed to be my toughest critique. As soon as I had a chance to sneak a peek at what the other contestants had produced in the first round, I had another reality check: this competition was going to be a lot harder than I originally thought. Most of the contestants produced high-end restaurant plated desserts. I was proud of my Cranberry Mint Julip dessert, but my plating was dated and not as clean as my competitors’ plates. #1 Do not be the first one to be voted off. #2 Make it more than half way of the competition. My favorite holiday song is “Put One Foot in Front of the Other” from the movie Santa Claus is Coming to Town. I just needed to put one foot in front of the other and just keep plugging away. “I just need to better than one person.” Goal #1: Check! My gift to you is Meringue Bakery's signature lemon curd recipe. Straight from my heart into your must-have recipe files. Wedding design themes and locations come in all shapes and sizes, including a cute-as-can-be rustic chic wedding. Rustic aged wood, modern copper accents, and wildflowers help to define this bride's style. Our bakery created a versatile country ruffled two tiered wedding cake. A perfect flavor combination for this type of event would be our buttermilk blackberry cake or our vanilla lemon chiffon cake.